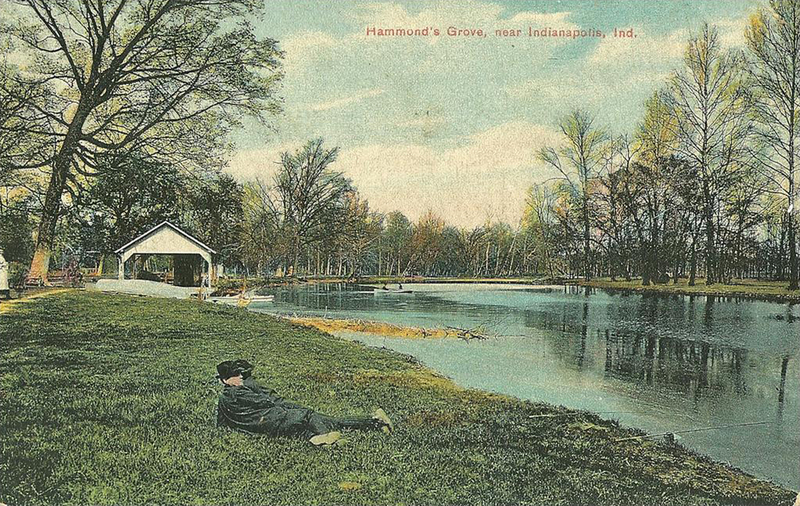 Opened in 1931, the original attraction was a man-made lake on land owned by the Voight family. Their acreage extended both to the west of and to the east of High School Road. At that time, the interstate system did not yet exist. The father of the family, Richard Voight, was born in Germany in 1873, and immigrated to the United States in 1891. He married Ohio-born Hattie Huber in Indianapolis in 1898. Richard and Hattie’s four children were Paul, Herman, Ernest, and Dorothy. The family first lived closer-in to town, in the vicinity of W. Michigan Street and N. Tibbs Avenue, where Richard Voight was the proprietor of a grocery store. By the time of the 1920 Census, the Voights resided outside the city limits in rural Wayne Township. 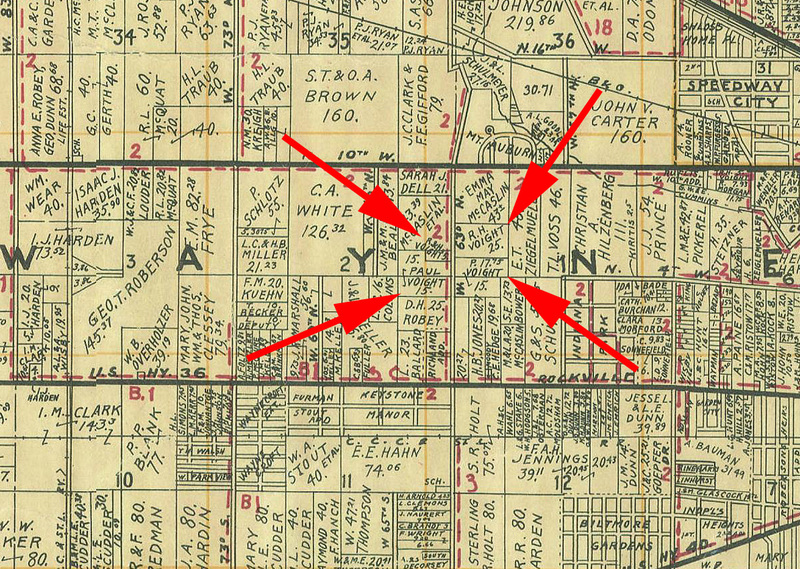 Their home was listed as being located on Ostermann Road, an early name for what later became West 10th Street. In 1920, Richard Voight’s occupation was listed as operator of a truck garden. In 1931, a lake was created on the Voights’ property, after fill dirt was excavated from a field for use on a nearby railroad project. Ernest, the youngest of Richard and Hattie Voight’s sons, conceived of an opportunity for the hole left in their field and created a swimming club, followed soon thereafter by a fishing club. Oldest son Paul then joined Ernest in the venture, acting as manager of the facility. Ernest’s and Paul’s siblings, Herman and Dorothy, were not involved in any of the Westlake attractions. A dance terrace with a retractable roof opened in 1935. Local bands and national acts alike played at Westlake Terrace. 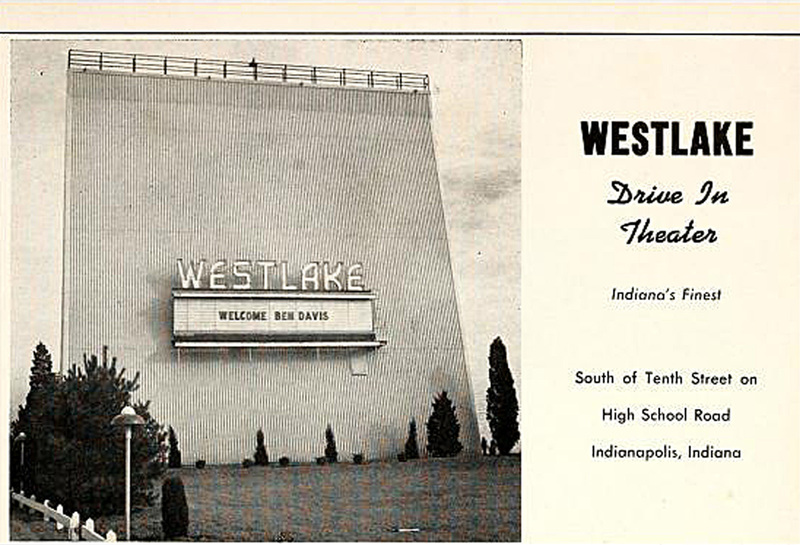 Because of its location, students from Ben Davis, Speedway, George Washington, Decatur Central, and Pike High Schools frequented it in the greatest numbers, but teenagers from all over the Indianapolis area and beyond enjoyed dancing under the stars at Westlake. In addition to the ongoing dances put on by the management, Westlake Terrace also became the venue for many high school proms and social club dances. A drive-in theatre was erected at the far north end of the Westlake compound in 1950. Soon thereafter, the Voight brothers made the decision to split the business into two entities. Older brother Paul took ownership of the beach club and dance pavilion. Younger brother Ernest became the owner of the drive-in theatre. Although Westlake may have appeared to the public as a single operation, from that point on, there were actually two distinct businesses operating adjacent to one another. Additional features were added to the beach club in the Fifties and Sixties. A miniature golf course was installed in 1956, with a variety of obstacles on each hole. 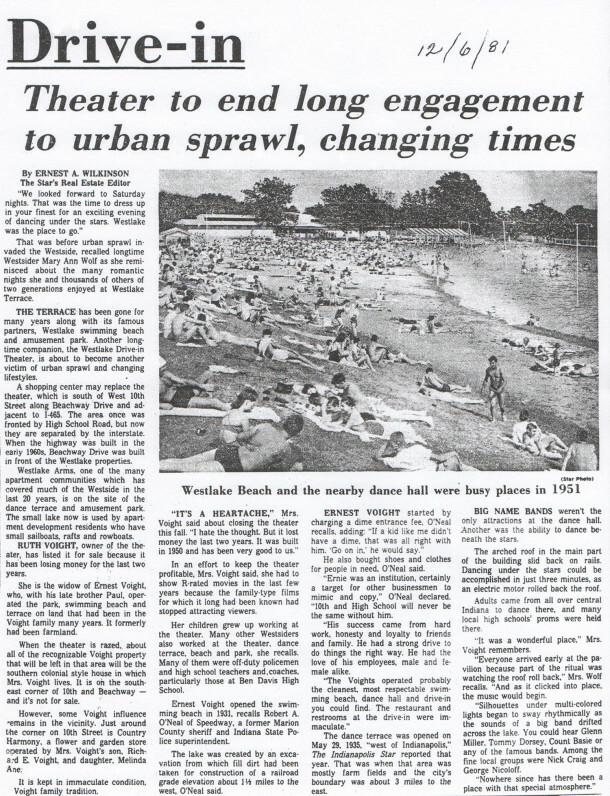 A concrete swimming pool was built in 1960, attracting more serious swimmers to Westlake. A model train provided rides around the property for Westlake patrons. A Go-Kart track was also added at some point. Westlake thrived until the arrival of the interstate system. In 1962, the western leg of the I-465 belt around Indianapolis was completed. High School Road was truncated and rerouted when the multi-lane, fast-moving highway was built. The Westlake attractions had originally fronted on High School Road, a well-traveled but nevertheless local street. 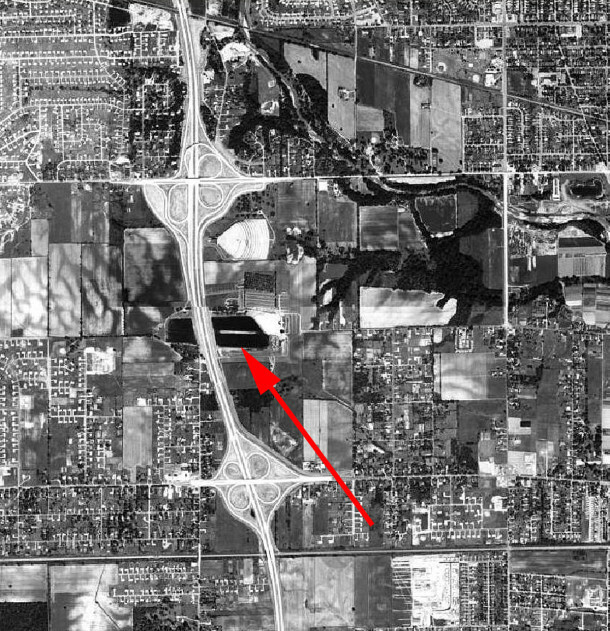 After the interstate went in, access to Westlake was instead on a frontage road alongside the highway, called Beachway Drive. Westlake was not as visible as it was originally. The interstate system also led to new housing subdivisions and commercial nodes that became competition for already-existing businesses. Westlake’s attendance began to decline in the late 1960s and early 1970s. 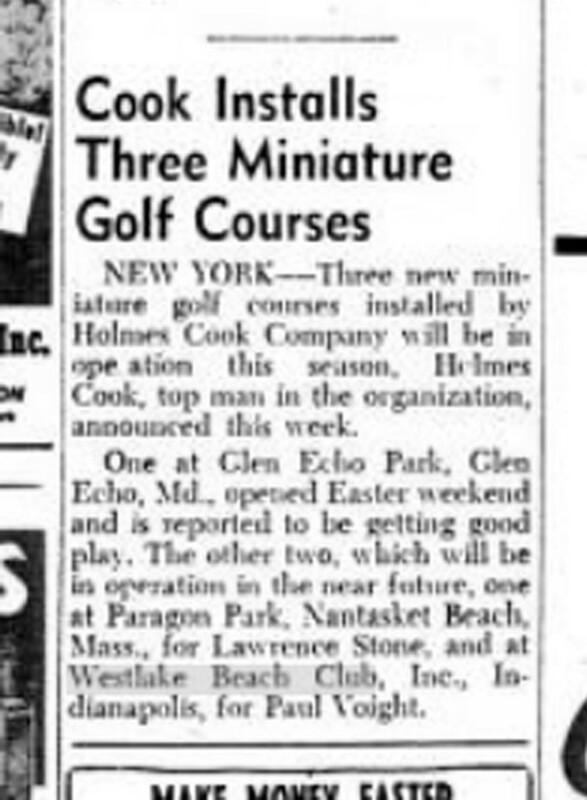 Westlake Beach Club — which included the lake, beach, swimming pool, dance terrace, miniature golf course, Go-Kart track, and model train — closed about 1971. That was the area that became the Westlake Arms Apartments in 1973. Westlake Beach Club owner Paul Voight passed away in 1975. 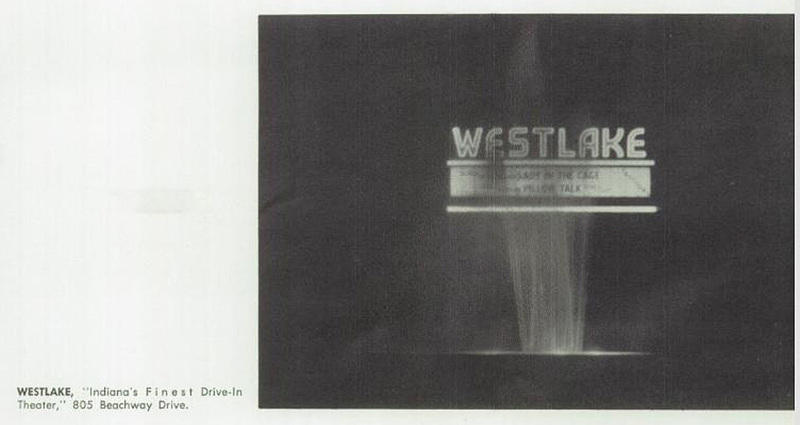 Westlake Drive-In Theatre owner Ernest Voight passed away in 1971. The theatre, which was located on a separate parcel of land from the property that became the apartments, continued to operate under Ernest’s widow and children until 1981. Although Westlake has been gone for many years, it has not been forgotten. An event to celebrate the memories made at Westlake was organized by devotees in 2006. It was such a success, it has become an annual gathering. The event even has a Facebook page. Here’s a link to the Westlake Beach Club Reunion Facebook page. Thank you for this article! Very informative. I still remember the drive-in theatre, and I lived in the apartments for a year, but didn’t know the history around the lake. I’ll be sure to ask my family about their memories of Westlake. Please do ask your family members about their memories of Westlake, and feel free to add more comments about Westlake here. You could also send your relatives a link to the article, and they could leave comments of their own. 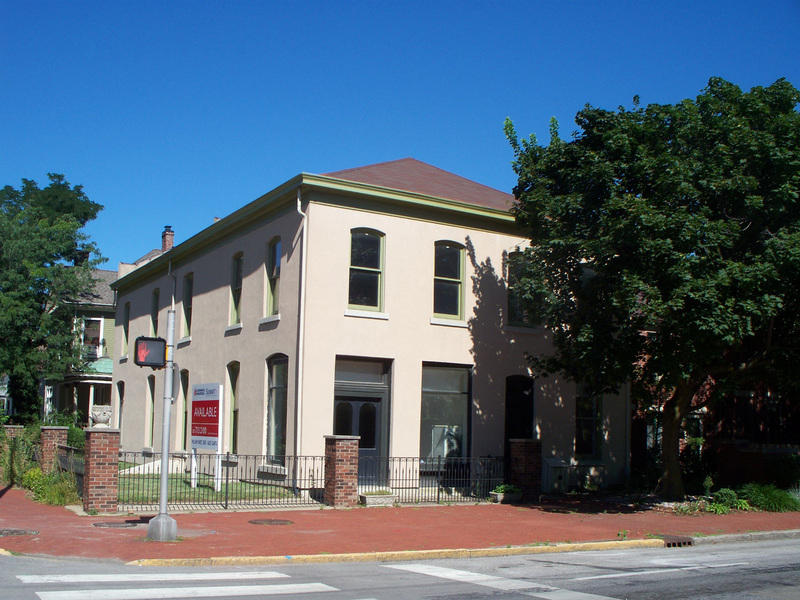 One of HistoricIndianapolis.com’s objectives is to get people talking about local history. My mom (who attended George Washington H.S.) still has her Westlake membership card – she loved the pool and dances. And said it was still pretty busy when she went in 1969. Sharon I see your name on the above announcement. What was the Euvola Club? A spotlight on the places Nick Craig Orchestra played might be of interest . His family should still have a lot of memorabilia. Email me if you need contact information. 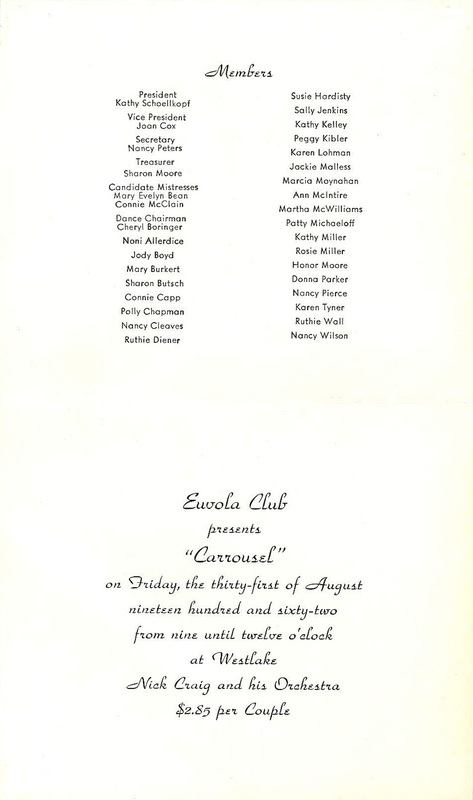 Euvola was a high school social club, a secondary school version of a college sorority. 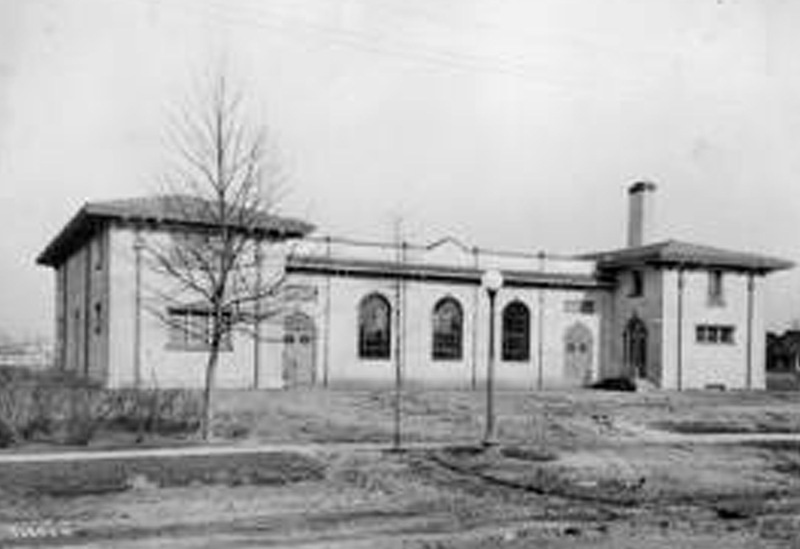 Euvola originated at Shortridge High School in the 1920s. 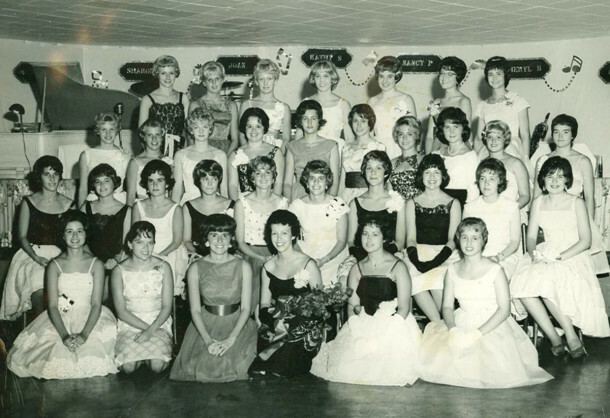 After North Central High School was built in 1956, Euvola expanded to include NCHS girls. In about 1964, students from Tudor Hall School for Girls were also included. 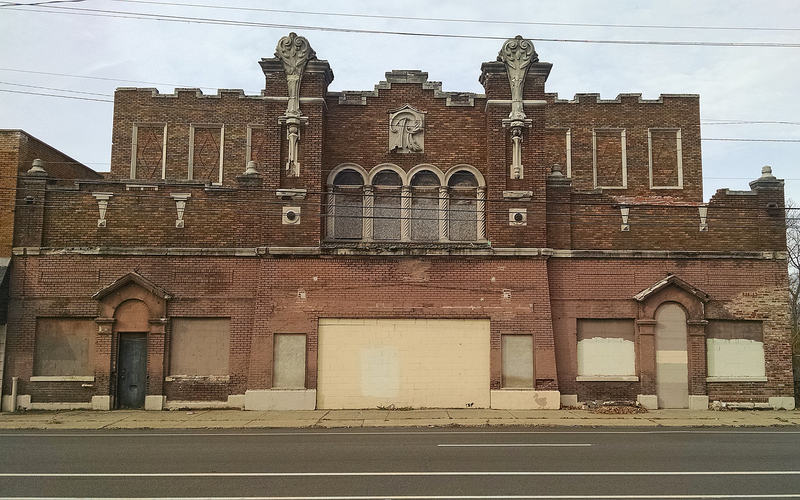 Social clubs were common in Indianapolis in earlier generations but lost their popularity towards the end of the 20th century. Although social clubs provided social activities for members who had similar backgrounds and interests, their exclusivity could be hurtful to those who were not asked to join. Although I enjoyed the friendships I made in high school social clubs, I wound up going to a college that did not have sororities and fraternities, so that I would not have to concern myself with possible issues attendant to that system. Thanks for a great and informative article on Westlake. The next reunion will be held on June 21, 2014, at the Lions Club Park in Clermont. Westlake was a very special place and most (all) of us have great memories and enjoy reminiscing every summer. Attendance was over 500 last Westlake Reunion 2013. If people want to purchase Westlake Beach Club Reunion tee-shirts or sweats, is there a phone number or e-mail address they can contact? Well, such a nice history except one point. Did you notice any Blacks in any photo? NO! Through my high school days up until 1973, we were NOT WELCOME there. So living about a mile away, I was forbid attending any events there. Hello Vickie,I went to Westlake with my family in those days. When my Brownie troop planned to go to Westlake, we had 2 young women of color with our gathering. When we went to the gates of Westlake to enter, the guards said we couldn’t go in due to having 2 young black women in our car, and they werent allowed to enter. The Brownie troop mother was given the option of taking the black girls home and coming back with the rest of us or just going home period. I was so appalled at the idea that some people could be turned away from any situation like this. I must have been so naive then. But as a young woman I truly knew that this was the worst kind of misstreatment. Sharon, Do you know if some of the Voight family developed the apartments, or at least used proceeds from selling the land, to get into other real estate ventures? Seems like I remember a company with Voights as principal being a partner in at least the Turnverein Apartments renovation with Stenz Construction/Development in the late ’80s, and that they also developed high-end residential and commercial properties around Lake Clearwater at 82nd and Dean, including the building Barrett & Stokely is in now. Probably other development as well. I have been trying to get the answer to your question since I saw it yesterday, but I haven’t had any luck yet. It did say in Paul Voight’s obituary that he was a builder. He may have been involved in the construction of Westlake Arms in 1973, but he died in 1975, so he couldn’t have been involved in the conversion of the Indianapolis Turnverein to condominiums. I will send you Paul’s and Ernest’s obituaries via e-mail attachment and update you if/when I find out more information about any construction projects in which the Voights might have been involved. Thank You SO MUCH for this!! Very Awesome. Crazy how much has changed since then. If I remember right, wasn’t there a disco or dance hall there at which a lot of single people used to hang out at at Westlake in the mid to latter 1960s, similar to the dance club or something upstairs at the ISTA Building downtown at Market and Capitol about the same time frame? I went to Westlake to swim quite often back in the 1950s. My girlfriend would walk from Mickleyville (W Washington St , Morris St and Waldemer Ave) to my house in Ben Davis, and we would then walk to Westlake from my place!!! We would stay as late as possible and make it back to my house just before dark. My girlfriend would stay all night, then walk home the next day. We stayed very slim!!! As much as I loved Westlake Beach Club, it was called a “club” so that only whites could use it! I grew up in Wayne Township and remember going to the Westlake Drive-In when I was a kid. About the only movie I remember seeing there was “Clash of the Titans.” I also loved it because there was a playground in front of the screen, and that was so much fun. I don’t think any of the other drive-ins at the time had one. To Vickie Graves. Segregation was never a part of Westlake Drive-In (my father’s business), but unfortunately ended up a part of Westlake Beach’s history. built anything that was not theirs. Thanks so much for posting this article. I never saw the lake as a place to swim but heard about it. In the late 60s-early 70s, we practically lived at Westlake in the summertime. We were members and swam at the pool nearly every day. I loved the Friday night Teen Dances at the dance hall. The roof would roll off just before sunset, and I always thought that was SO cool, and we always loved the live bands that would play each week. We went to the drive-in just about every week, as well and, like Matt B., loved getting there early to play on the playground just in front of the screen. My grandmother lived in the Westlake Apartments – sometimes when we visited her, we would go to the lake to fish. At the pool, I remember the separate diving pool where there was actually a HIGH DIVE (you don’t find those anymore). 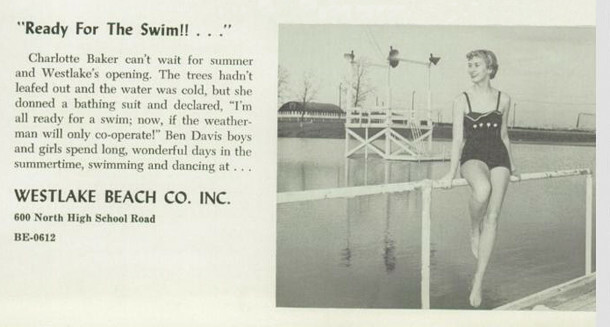 The boys would all show off their dives for the girls who were sitting on the benches at the opposite end of the diving boards. Some of us got to be good at making huge splashes to wet down the spectators. Rick Voight, thank you too for your comments. If you have pictures of Westlake in its days as the largest swimming pool in the world, I would love to see them. Had a lot of fun at Clemont, drag-racing with Voight. He had a bad Pontiac. I remember hearing he passed away. Had a lot of clean fun and lots of friends. Those were the good times. I worked there from 1958 until 1966. Probably kept me out of a lot of trouble. Wednesday night sock hop (teen dance) at Westlake was a must during my high school years. I went with a group that attended both Tech and Howe High Schools and drove out there from the east side of Indy. Swimming was usually relegated to occasional weekends at Westlake, while visiting other pools closer to home during the week…..and of course, the drive-in was a great place for date night. Westlake was a great place to go, matched only by Longacre and the Indiana Roof. We of the 50’s and early 60’s were lucky to have such great places to hang out, enjoy and make wonderful memories. Thank you so much Sharon for this amazing article. Ernest Voight was my grandfather and I grew up on Beachway Drive in the smaller ranch style home next to the Colonial style home my grandfather and his brothers built. 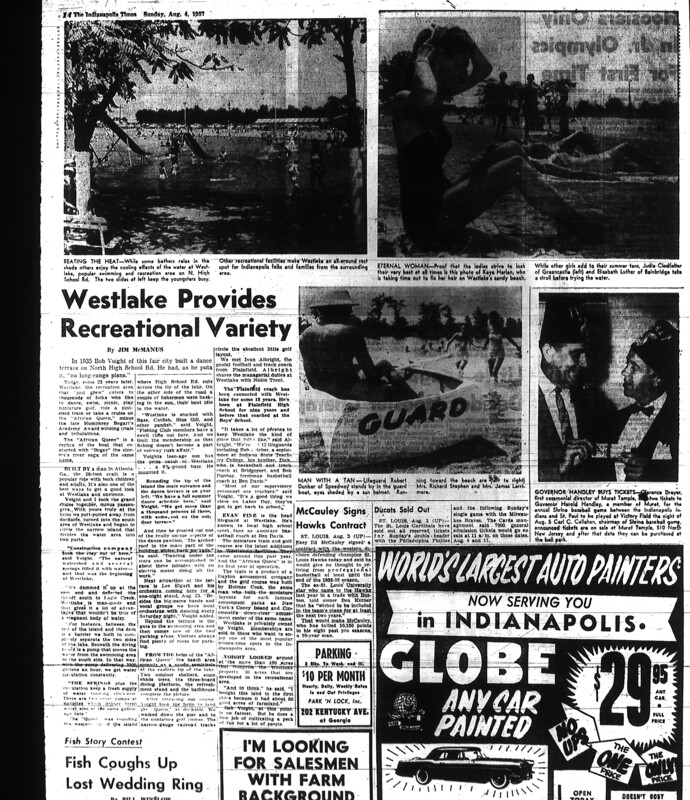 I have very few memories of the pool but I have a lifetime of memories at Westlake Drive In Theatre…”Indiana’s Finest Outdoor Showplace”! Many of my childhood friends worked summer jobs at the Drive In either making hotdogs, pork tenderloin sandwiches, and of course their famous Shrimp Dinners. During Fourth of July, My dad used to light the fireworks off behind the Drive In (in our backyard)…it was a highlight for my brothers and I every summer. Thank you for sparking so many amazingly beautiful memories for me! Wonderful article, thank you! I recall only going to Westlake once, in the late 60s, as a guest of the Eakin family of Speedway. My family belonged to Westwood. Regarding the age of the lake itself, I’d suggest that it was dug in 1918, as that is the year stamped on the concrete bridges of the Pennsylvania Railroad (now CSX), which was built after the Big Four Railroad (later New York Central, now also CSX), so had to be elevated above it where they crossed at Rockville Road. When I lived at Westlake in the mid 80s (didn’t everybody at some point? ), I met an elderly man who was helping a neighbor of mine move out. Along with the info about the railroad project. he said that the lake was used for water survival training during WWII by the Troop Carrier Command at Stout Field. I regret I didn’t get to talk to him more, as the family was in a hurry to leave. One question for the family: where is that house today? I believe it was moved, not demolished. So many memories from my childhood are centered around this place. It was the nicest, cleanest, family oriented drive-in theater that our family ever went to. My family regularly frequented the theater throughout the summer. We lived maybe 2 miles from Westlake. Even the food at the snack bar was tasty there and at the lake/pool. We hung out most of the summer at the pool. Always got our membership card ($10.00 for the whole summer) as soon as the pool opened. The dances in the summer were always attended regularly by myself and my high school friends. When I think back now, I realize what wholesome fun it was for all of us kids. There was rarely a problem at the dances. And there were huge numbers of kids that attended those dances, and frankly I don’t remember a lot of security hanging around. I don’t think it was a big problem. I never knew anyone to abuse alcohol or for nasty altercations to occur between the kids who attended. If it happened, it was rare. 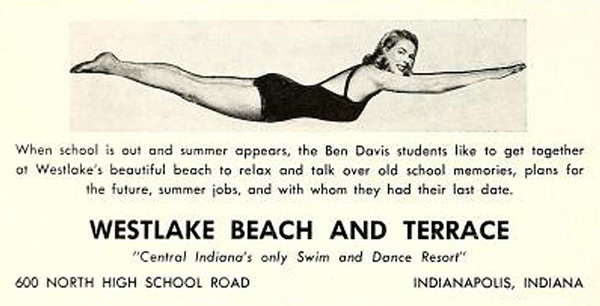 The pool and beach were always well kept, and the staff mainly consisted of teachers from my school Ben Davis H.S. and with students & former students who had summer jobs as lifeguards. How lucky we were to have that childhood. To this day I really believe that a lot of minor juvenile delinquency can be avoided if proper recreational activities are provided for teens. Many thanks to the Voight family for providing what eventually became a much-beloved Westside institution. Thank you so much for reminding me of all these wonderful memories. Who can I contact to purchase the original westlake tshirt that was white with the red diver etc.? Thanks for your kind assistance. 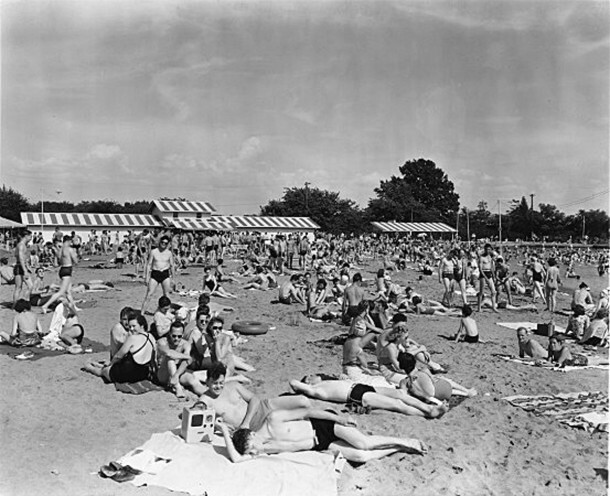 I worked at the beach club from 1966 until 1971. Knew Paul, Judy, and Dave very well and enjoyed every minute working there. Eventually worked only up at the Terrace for the Weds. and Sunday dances. I came back from Vietnam and did not know the place was gone and apartments had been built. Please keep contacted on the happenings I would love to know. I learned to swim at WESTLAKE and have lived on the WESTSIDE all my life. After retirement sold all of everything and chose to move to WESTLAKE, thinking things would be the same. Well things are never the same. I sure miss the good times. Westlake is where I met my husband Paul R. Barks in 1960. Both my husband and his father John Barks (teacher at Center Grove) worked at Westlake. Westlake holds a special place in my heart. my uncle was herman voight. he was married to my dads sister Freida .